Former Air NZ 767-319ER N930WE (26915, L/N574, ex ZK-NCJ) departed ILN 05 Jun arriving TLV 06 Jun. N830WE (26913, L/N558, ex ZK-NCI) and N730WE (26912, L/N509, ex ZK-NCG) appear to be still at ASP. Unclear what's going to happen to 830WE and 730WE. Given that none of the 3 had sold for over a year, it didn't surprise me that 30 West would unload one of them at the discounted price that would make it suitable for freighter use. They could do that to pay down debt, pay interest, etc., while still hoping to sell or lease the other two for more money. The 30 West web site now shows the two other aircraft as "Under Contract". So either they're both also going to ATSG, or 30 West found another buyer. They're a good age, have Pegasus, well-maintained, etc., so they're probably quite satisfactory for a buyer who has lower-utilization passenger service for them. But given ATSG's continued appetite for good aircraft to convert and the paucity of available AA frames until 2019 when retirements resume, ATSG is an obvious potential buyer. FX took delivery of another 767F yesterday 6/10 - N161FE PAE-IND. Skyliner-aviation.de reports that Kam Air took up a pre-loved 767-33A/ER with previous registration UR-***. Could this one of ex-Aerosvit or UIA B767-33A/ER? I am not sure if this has been discussed: 4X-EAK El Al B767-3Q8ER, which was severely damaged during ground collision with Germania B737-76J D-ABLB on 23rd March 2018, has been declared a write-off. She was a 21.2 years old veteran, ex-Air Europe SpA. The 737 was fixed and flown out of TLV recently. I am not sure if this has been discussed: 4X-EAK El Al B767-3Q8ER, which was severely damaged during ground collision with Germania B737-76J D-ABLB on 23rd March 2018, has been declared a write-off. I wonder if after being "totalled" for the current owner, the company that takes possession of it could decide to repair it rather than part it out. Unfortunately she is being parted out as we speak. There is a photo at competitor's website, painted all white with some parts missing. She might be parts donor for current El Al 767 fleet. Not likely to be from UIA/PS: all three of their 767-33A/ER are accounted for: UR-GED and UR-GEC are both airborne right now, with PS flight numbers, under UIA callsigns. UR-GEB also seems to have flown for PS today. There are other 767-300 subtypes in Ukraine, but for 767-33A/ER, this seems to be it. Julius: I don't see the aircraft being parted out in that photo. The engines are off, but that's standard in a situation like this. Painted white -- same thing. The aircraft, at least in that photo, looks quite intact. You could be right, but that photo doesn't, to me at least, show anything conclusive. Also, the equipment in the rear could be for repairing the stab. Skyliner reports now that it is indeed an ex-AeroSvit frame, reg. UR-AAH. This bird must have been on the ground for almost 6 years now. Correct. AeroSvit entered its final dive in January 2013, and never recovered. 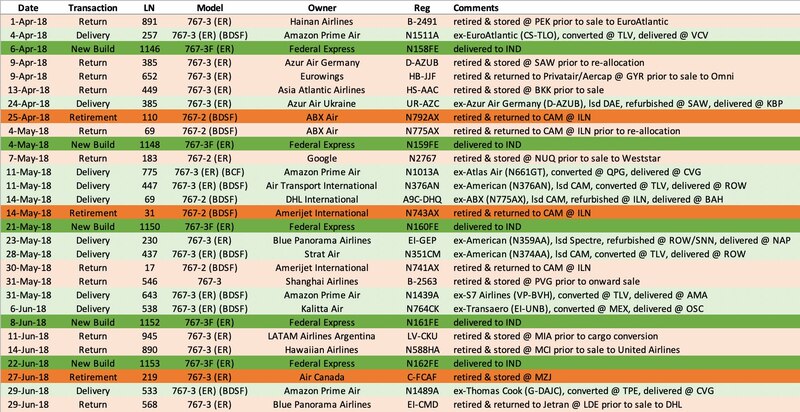 Rouge and Condor are taking the most from the 767, and Prime Amazon as well cargo wise.. I wonder how is reliability vs. fuel and mx cost vs. low lease or purchase rates are matched to make flying 30 year-old frames as efficient as is.. Yes, true to what you and NG263 have stated, I have a hunch it should be coming from Aerosvit fleet, confirmed by skyliner-aviation.de now. However, let's wait for the real aircraft photo to confirm (Skyliner is susceptible to frequent error). It is good those ex-VV/BI 763ER finally can find new home, if confirmed. I hope I am proven wrong to be honest, like what you have mentioned those equipment could be for repairing. I am also hoping she will be fixed. Too early to die. She can have another 10- years hauling cargo. We need some insider info what future holds for her. They would not paint the aircraft, 4X-EAK, white if it wouldn't be a write off. This frame for sure has had it's last days in the air. Boeing 767-375, msn 219, Reg:C-FCAF, Air Canada, ferried 27jun18 MCI-MZJ for storage. Another 767 left the skies. Yep. That one seems a little old (30+) for cargo conversion. Are there any news concerning N376CM? This one has been stored at TLV for about 2 years now. I think this one is the youngest ex Qantas frame with only 13 years in service and in storage since being wfu. I think this is the one that was sold to Israel. Don't know what has happened to it. It is no longer registered in the US. I've been away for a while but back now. I think I'm up to speed on everything but please advise if i've missed anything. > I-AIGJ (Air Italy) was retired and returned to its lessor @LED. Part of Qatar Airways' plan to retire the 767 fleet and replace them with A330s owned by Qatar. LN 610. 1996-build. Originally delivered to Britannia. > CS-TSU (EuroAtlantic Airways) was delivered following refurbishment @NAP and was flown to @SNN for painting. First of three frames EuroAtlantic is taking from Hainan Airlines. LN 891. 2002-build. Originally delivered to Hainan Airlines. Keeping an eye out for N363UP (UPS) which should exit conversion @QPG any moment now. Anyone have any info on N743AX (Amerijet), N787AX (ABX) and N752AX (ABX). Maintenance? Retired? New Operator? 743ax should be going to West Air after a heavy check and some avionics upgrades, but that may have changed. I don't know if they go on your list yet, but 930WE was purchased by CAM and sent to TLV for conversion. 830WE and 730WE are under contract for sale to someone. And 380AN apparently was purchased by Cargojet (or a lessor other than CAM who will lease it to Cargojet), and was sent to TLV for conversion. 752AX is at GSO for some reason. Word was that it might be going to DHL in the Sandbox but that's not for certain, and is a little odd because that's where it came back from earlier this year. British Airways G-BNWA finally exited the fleet yesterday after 29 years flying duties. RA-73030 (Azur Air) was delivered to @DME on 7/13 after refurbishment @SAW. LN 378. 1991-build. Originally delivered to Air France. Most recently operated for VIM Airlines. And only 65000 hours. Yikes! I see that basource.com reports that BA 767 300ER G-BNWA flew from LHR to St Athan for parting out and scrapping yesterday. According to the BA source there are only six left in BA service now. I don't know if that includes the one farmed out to OpenSkies in Paris or whether that too has been withdrawn now. N163FE (Fedex) has been delivered and will fly out to @IND later this afternoon. LN 1155. New build. 10th new 76F delivered to Fedex this year. EI-CMD (Blue Panorama) has been retired from service and stored @LDE on 6/29. It will be sold to DHL and converted to cargo in due course. LN 568. 1995-build. Originally delivered to Vietnam Airlines through a GECAS lease. Blue Panorama maintains a fleet of (3) 763ERs. N592HA (Hawaiian Airlines) was retired and stored @MCI on 7/23. This is the second of three Hawaiian 763ERs being sold to United Airlines. LN 898. 2003-build. Originally delivered to Hawaiian. 6 remaining 767s left in the Hawaiian Airlines fleet, all of which will be retired in next 12 months. N383AN (Cargo Aircraft Management) has completed cargo conversion @TLV and has been delivered to @CVG. Unclear at this stage which company it will fly for once painted. LN 500. 1993-build. Originally delivered to American Airlines. 767 Conversion #14 of 2018. It was painted into Atlas colors at AMA; there's a photo out there of it post-paint on June 11, and it moved a couple of days later to SAT, where I assume it's being worked on at VT Aerospace (ST Aero). G-BNWB completed its last revenue flight today before heading to St Athan in probably a few days. It's supposed to go there tomorrow! N641GT (Atlas Air) appears to have suffered a potential complete haul loss as a result of a hard landing this morning @PSM. Cracks in the fuselage can be seen in the pictures posted (https://www.facebook.com/242181938605/p ... 463458606/). I doubt it will be repaired given its age and insurance value. LN 417. 1992-build. Originally delivered to Asiana. Possibly a hull loss. Extrapolating from SDRs she has about 84000 hours on her, so not exactly clapped out but iffy on repairs depending on the final bill. Crunched fuselages have been fixed before, although on much younger airframes. N730WE has been purchased by CAM. This is one of 3 retired NZ 767-300s purchased by the small lessor 30West and renumbered 930WE, 830WE, and 730WE. (x30WE, get it?) N930WE was previously purchased by CAM and is in conversion at TLV, but the fate of the other two was unknown. 30West recently indicated that the other two were "under contract" to one purchaser, so it is likely that CAM will acquire 830WE as well. N730WE is LN 509. 1993-build. Originally delivered to Air New Zealand. The first of three ex-JAL frames for UPS, N363UP has completed conversion in QPG. Operating on delivery flight as UPS9585 QPG-ANC and UPS9586 ANC-SDF. UA is doing their part in the sale and the transfer of ownership will happen soon. All 767s retired by March 2019. I think we need to come to our senses: there won't be any 763's flying pax in 10 years. However, most early-90's A320's will still be around. It's the 1988 factor. As I feared, not yet 12 year old LN 950 will be converted to a freighter. The Skyliners article rather oddly days that LN 568 was ferried to XSP for conversion for DHL air. I'm not even sure the runway there can handle a 767. I think they more likely meant QPG. N165FE (Fedex) currently on its delivery flight from @PAE to @IND. 11th new build 767 delivered to Fedex this year. LN 1157. What were 749AX and 752AX having done at GSO? Seems like CAM aircraft are usually maintained at ILN, by AMES. But GSO's major MRO is HAECO Americas (formerly TIMCO). Fedex lately withdrew the last of the 3 leased Latam 767s. While looking up their fleet I saw that there are 2 'oddballs' in the 767 fleet. The 2 birds are ex-SilkWay, one even with winglets. Both of them have not flown, one for about a month, the other for two months. Does anyone know if they will be withdrawn aswell? Or is it just some kind of checks?